What's your favorite class? Poli Sci 202, because I love the subject matter and Dr. Way is a great teacher. Do you play any sports? Soccer. It is the best sport in the world! What is your favorite thing about Christendom? The teachers. They're exceptional—teaching things the way they should be taught. Why did you choose Christendom? I wanted to learn the Truth. Plans after graduation? Become a top real estate agent, write music, and maybe even sing on the side. Ultimately, I hope to pursue a life with Christ and try to help others get to heaven. 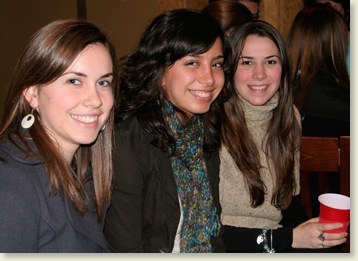 Last Monday, Christendom students packed into Kilian’s Café once again for a pub night, happy to be back on campus and with their fellow classmates. 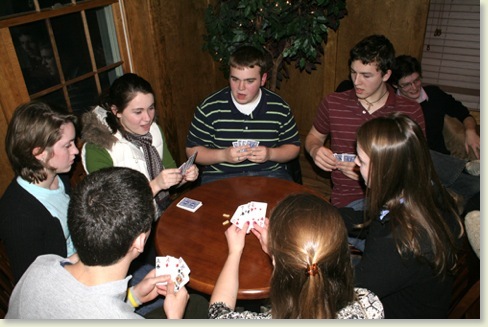 Music played in the background as reunited friends chatted, played cards, and introduced themselves to this semester's new students. The Student Activities Council provided drinks and snacks for the evening, which were happily munched on by the excited students. The students seemed to share her feelings, enjoying the chance to chill before the hard work of liberal arts academia kicked in. Freshmen get competitive over a game of spoons (using Sour Patch Kids). 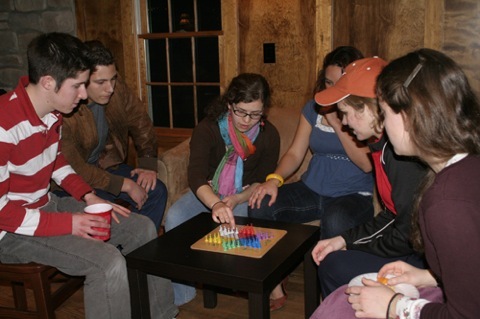 Students take on some new transfers in a game of Chinese Checkers. 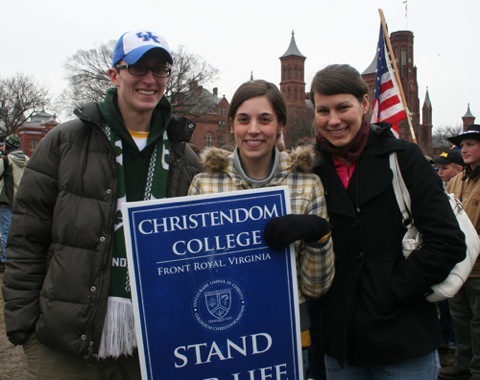 The day of the March for Life started early for Christendom students and faculty, with Mass in Christ the King Chapel. The weather was rather dreary; drizzling rain on the students as they made their way to the buses, but it didn’t seem to dampen their excited spirits. After a prayerful bus ride, the students arrived in D.C. and headed for the Mall, where they listened to addresses by political and religious leaders at the rally. 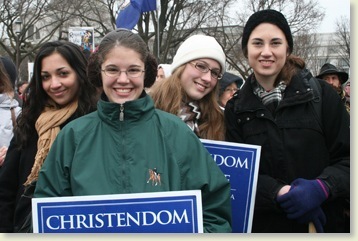 Around two-thirty, the March began as Christendom students proudly held the Christendom banner high, and walked down Constitution Avenue to the Supreme Court Building. For many freshmen, this was their first time at the March, while others said they had been attending the March for several years. “It’s really inspiring to see all the people gathered here for this,” said Sophomore Andrea Smith. 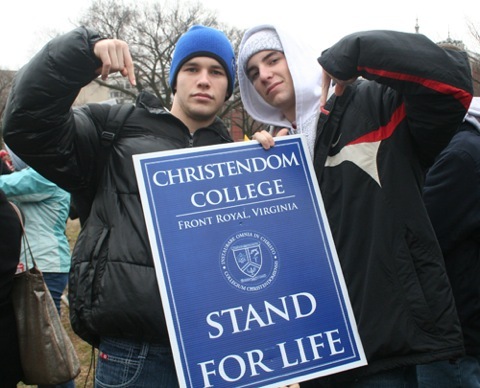 Christendom College students are active in pro-life efforts year round, most notably each Saturday morning as many of them travel to Washington, D.C., to protest outside a Planned Parenthood clinic. Other students take part in pro-life activism through the Students for Life groups while others help out with the College’s outreach program and work with the local crisis pregnancy center. 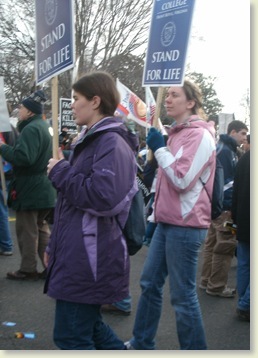 Seniors Joby Norton, Marya Doylend, and Lindsey Mersch stand for life at the rally. 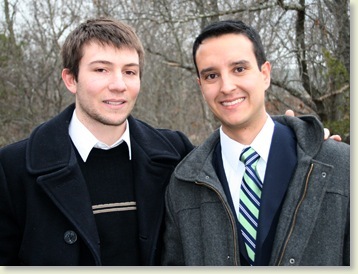 Freshmen David Townsend and Tim McPhee brought passion and enthusiasm to this year's March for Life. On Saturday, Crusader gym was filled with the sounds of swing as students crowded the floor for the Welcome Back Dance. 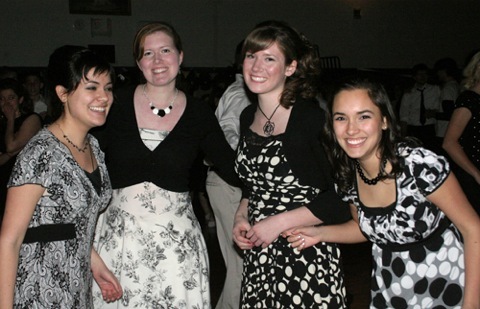 Dressed in black and white for the Oreo-themed event, students chatted and laughed between dances, and enjoyed milk and America's Favorite Cookie. As the first dance of the Spring 2010 semester, the Welcome Back Dance gave everyone the opportunity to socialize with fellow classmates and friends, and to meet new and returning students. Freshman Tim Beer swings with Freshman Emi Funai. The girls really got into the theme. If they had had some funky hats, it would have looked like the Ascot scene of My Fair Lady. 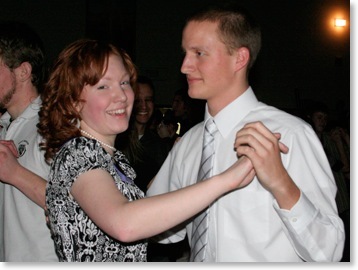 Freshman Chris Roberts sashays with Sophomore Angela Swaggler during the Virginia Reel. Monday afternoon the Chapel Crypt was filled with eager students, waiting anxiously to hear Dr. Warren Carroll’s talk entitled “The Fall of the Soviet Union.” A large number of students were present, as well as several faculty members of the history department. Dr. Carroll began his talk after a brief introduction by History Professor Dr. Adam Schwartz. 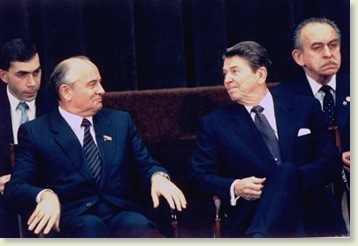 Carroll held the students' attention, telling them engrossing details about the fall of the Soviet Union, while interjecting humorous anecdotes. 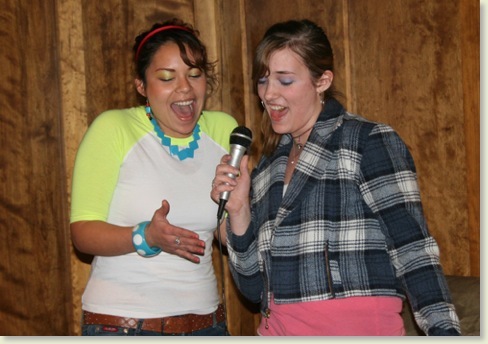 Get this talk at Christendom on iTunes U.
Monday night, several female Christendom students donned their best '80's garb and sang their hearts out in St. Kilian's Café for "Ladies Eighties Karaoke Night." The event was planned and coordinated by Head RA Emily Jaroma, who did a great job organizing the event. Girls took the stage, and sang hits like Whitney Houston's classic "I Will Always Love You," "Wind Beneath My Wings," and many more songs. Girls who shied away from the stage munched on snacks and enjoyed the humorous entertainment. 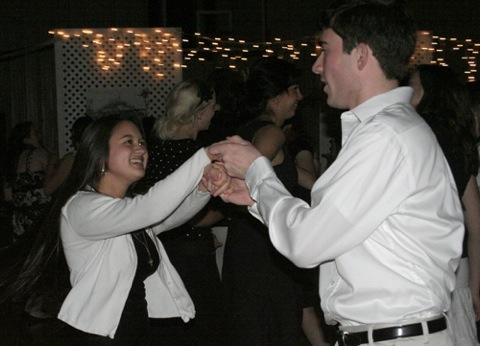 "It was one of the more fun and different events hosted on campus. It was especially fun because it was just girls. 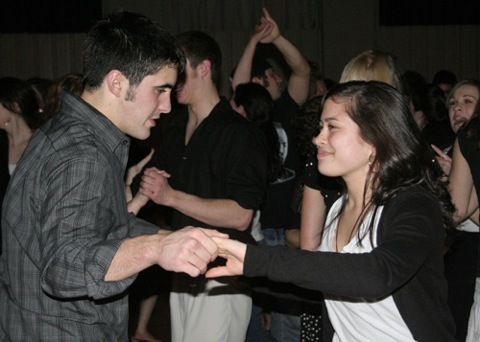 It provided a more intimate atmosphere, and a better bonding experience," said Sophomore Adele Smith. The Christendom RAs and Proctors are continually cooking up great ideas to get the girls together and have some fun bonding time. 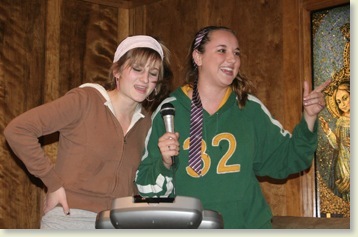 Freshman Theresa Ploneda and Sophomore Liz Sartor belt a ballad. 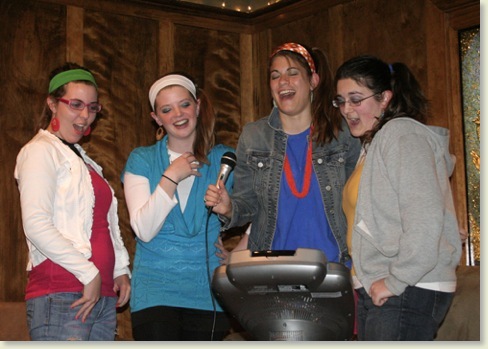 Freshmen Jacinta Ferri and Jane McGuire hit the high notes with Seniors Emily Jaroma and Catie Carducci. ust before the Christmas break, Prof. Wunsch took senior philosophy majors Tim Lanahan and Dennis Toscano to The Catholic University of America for a lecture given by Monsignor John Wippell, the Theodore Basselin Professor of Philosophy, entitled “Aquinas on Creation: A Philosophical or Theological Issue?” The lecture was the last in a series of lectures in the 2009 Fall Philosophy Lecture Series on Truth. The lecture was attended by faculty members of philosophy department, graduate and undergraduate students, and other curious seekers of wisdom. 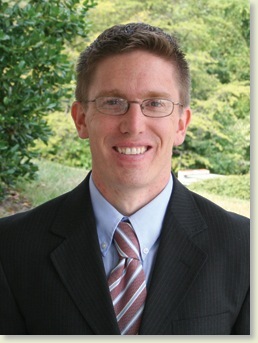 Prof. Wunsch has long been an admirer of the work of renowned Thomistic scholar Msgr. Wippel and when he heard that he was giving a lecture on a topic that relates to his own doctoral dissertation, he “simply had to attend.” Considering that the topic also relates to an elective course he taught in the fall of 2008, he made the decision to invite two students who took the course from him to attend the lecture as well. “I thought it would be a great chance to open Tim and Dennis to the philosophical community at Catholic University and hear a lecture from a first-rate scholar,” stated Prof. Wunsch. Tim and Dennis agreed with Prof. Wunsch’s summary of the afternoon. “It was solid,” commented Tim. The men and women played their first games of the new semester this week and unfortunately all 3 games resulted in losses for the Crusaders. The men started the semester with a tough game against Maryland Bible College this past Saturday, the day after the college was closed for the March for Life. The Crusaders fought a hard battle, playing without Junior Matt Rensch (enjoying a semester in Rome) and Matt Hadro (graduated). The Crusaders looked for people to step up and fill their void: Brian Fox and Brendan Krebs would do that. The game had an exciting up and down tempo that featured dunks by Maryland Bible and swift passing with return baskets from the Crusaders. Unfortunately Maryland Bible would be too tough as their point guard Terry Hosley would score 41 in a night where he couldn’t miss; the Crusaders fought hard but ended with a 78-102 loss. 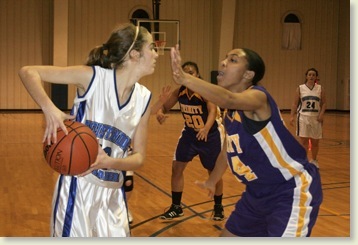 The Lady Crusaders were back in action last night vs Trinity University. The women’s team, also like the men’s team, lost 3 key players in Meghan Kavanagh (graduated), Mary Hill (enjoying a semester in Rome) and Mary Kate Vander Woude (also enjoying a semester in Rome). The team, despite being overmatched by the size and athleticism of Trinity’s team, fought the whole game being led by the energy of Jane Snyder and Emily Baldwin. 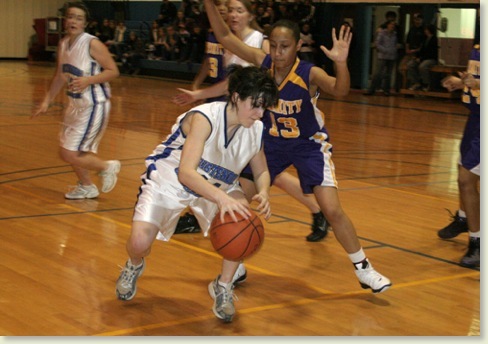 The Trinity team proved to be too much though as the Lady Crusaders fell 12-81. 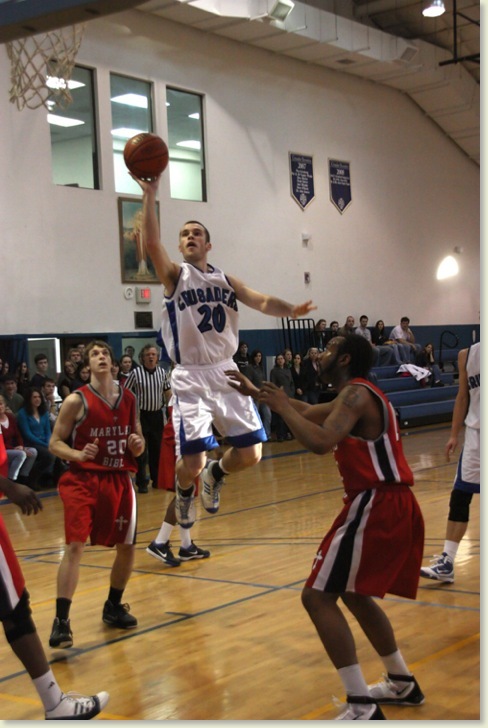 Also last night the men’s basketball team played a conference game against the Patrick Henry Sentinels. The 2 teams had already played each other twice in the fall semester, resulting in a split so the tie breaker would be an important game for both teams as they build momentum for the conference tournament in two weeks. The Sentinels came out quick and built a quick lead only to see it gradually trimmed by the play of the Crusaders led by Brendan Krebs and Tim McPhee. The second half saw the Sentinels execute very well offensively. 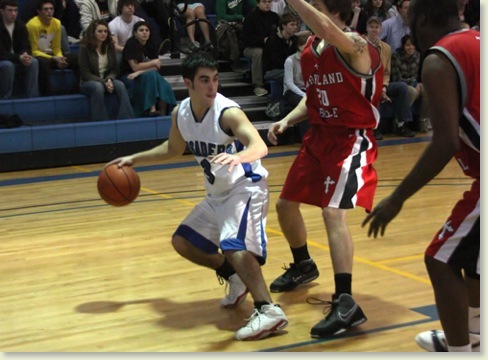 Jensen Near scoring repeatedly down low, he finished with a game high 20, and played a smothering defense which held the Crusaders to just 23% shooting from the field. The Crusaders clawed their way back but couldn’t get the game within 8 points down the stretch and fell by a score of 56-67. Both teams are in action this weekend as the Lady Crusaders travel to Valley Forge Christian College to play the Patriots and the men play at conference opponent Mid-Atlantic Christian University in Elizabeth City, NC tomorrow night. 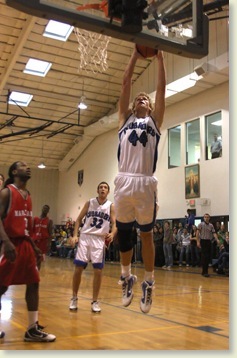 Freshman Tim McPhee prepares to take a free-throw shot. 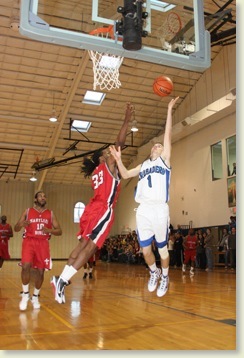 Freshman Tim Beer's ball-handling skills are one of the many weapons in the Crusader's arsenal. Junior Jane Snyder takes it to the hole. 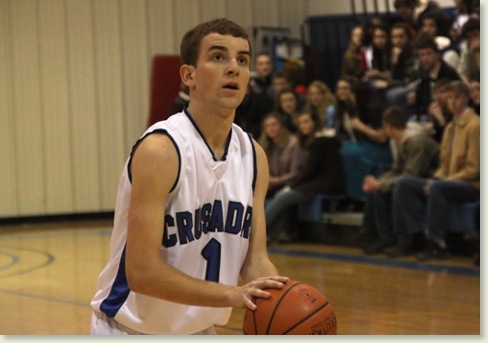 Freshman David Townsend adds 2 points to the Crusaders' score. Q. What happens if I have been accepted to Christendom and I do not make my $500 deposit by the date that is mentioned in my acceptance letter? Do I lose my place? Can I still get in to Christendom for the Fall? A. Anytime someone is accepted to Christendom, we send an acceptance letter and put in a date by which a person is supposed to accept our offer of admission and the way that they show us that they are committed to coming to Christendom is by sending in $500. So that’s what the deposit is all about. If a student sends in his deposit by the date written in the letter, then we guarantee him a spot. If that date passes and he has not sent in the money, then we do not guarantee him a spot, but it is still sometimes possible to attend. 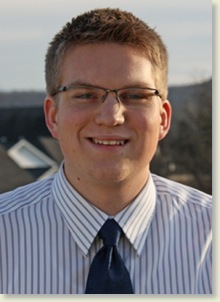 From what I can tell, most people who think there is a pretty good chance that they will want to attend Christendom do send in their deposits by the requested “deposit date” because they know that if something changes they have until May 1 to still request a full refund, if necessary (although only a very small percentage request a deposit refund each year). Generally, students should be pretty certain that Christendom is their college of choice prior to sending in their deposits. If anyone has questions about applying, visiting, scholarships, financial aid, campus life, rules and regulations, majors, core curriculum, transfer credits, or even about the food here at Christendom, please do not hesitate to contact me at any time.